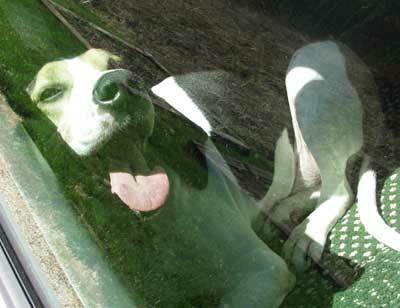 Watch and listen for dogs trapped inside of vehicles on warm days; they could die of heat stroke. A sunny mild 72 degree day will produce 116.6 degrees in just 60 minutes, a 2005 Stamford University study proved. Opening the windows a crack produced only a slight reduction in temperature. Take action if you see dogs panting heavily. You might save a life. I had another tip prepared for this week, but after reading four news articles this week about dogs dying of heat stroke, I changed my plans. Spring is early this year. And as I learned, even the most dedicated animal rescue volunteers can lose track of time with deadly results. Nine rescue dogs were waiting in the back of a closed truck without air conditioning while two animal rescue volunteers readied their adoption setup in a Georgia Petsmart on April 2, 2010. It was an unseasonably warm sunny day. When the volunteers returned to the truck to bring the dogs inside, they found unimaginable hell. What can you do if you see or hear an animal stuck in a hot vehicle? First, observe the situation carefully but quickly. Walk all around the vehicle, looking at all window openings, and notice if the motor is running with air conditioning on. Is there some shade? Is the dog or cat panting heavily and continuously? Or is the panting intermittent and related to the stress of your approach? Look for signs of drool or spittle around the mouth that might indicate prolonged panting. If the animal doesn’t appear to be panting heavily and the air conditioning is running, leave, taking note of the time. Return in 15 minutes to check to ensure that the air is still running. If the animal isn’t panting heavily, and the windows are generously open or the vehicle is in shade, leave, taking note of the time. Return every so often to check that the panting has not increased. If the animal is already laying down, panting heavily and unable to rise, you must spring into action immediately. Act like a rescuer would, because heat stroke will kill this beloved pet in a few minutes. Enlist a passersby to witness your actions and quickly break a window with your elbow or a heavy object. Ask the witness to dial 911, and ask another one to RUN to the store service desk to insist on an immediate public address to the owner (describe the car and animal). Remove the suffering animal from the vehicle to a shady spot on nearby grass if you can do it safely, and fan the air overhead with anything handy. Ask if anyone has a water bottle; if so, dribble water into the animal’s mouth, and wet his ears and neck to speed cooling. Wait for the authorities and owners to arrive. Ignore any theft alarm; you are not a thief. You are a rescuer saving the life of someone’s pet. If the animal is standing or sitting upright and panting heavily, you have more time. Write down the vehicle make and model, color, and license plates. Enlist a passerby to go to the service desk to request a public address to the owner. Stay with the dog or cat until the owner returns. If the owner doesn’t return in 10 minutes, and the animal is panting more heavily, call 911. What are the laws that relate to this crime in your state? Why is heat so deadly to dogs? They can’t perspire to exhaust body heat like we humans can. The only way they can rid their bodies of excess heat is through panting and limited perspiration through their paw pads. Heat stroke is quick to kill, and very young or old, obese, or unhealthy animals are more susceptible. What are the symptoms outside of heavy panting and drooling? Look for signs of restlessness (laying down and rising again and again), lethargy, dark tongue, lack of coordination, and even vomiting. If you see dogs playing sports or running with their owners on hot days, be sure to say something! Veterinarians will tell stories of how quickly a happy dog can become overcome with heat stroke and die on a hot day. They will play or run until they drop. Vet clinics see them rushed into care by distraught owners, but only some can be saved.